If there is one thing you can learn from Dan Schawbel, it's how to choose a niche and own it. He's a 20-something social media consultant for EMC as his day job, but over the past several years he has focused his blog and extracurricular work on becoming a personal branding expert for the millennial generation. In that time, he's launched a magazine, written a blog and even created his own awards for personal branding, which was when I first connected with him. 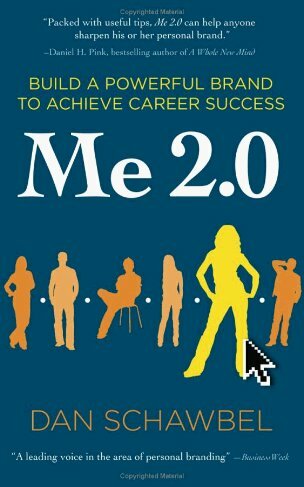 His first book, titled Me 2.0: Build a Powerful Brand to Achieve Career Success came out this week where he shares his lessons for creating a strong personal brand and the impact it can have on your career. In this interview he shares some insights from the book and offers an inside look at his path to where he is today. It's a story worth paying attention to. 1. Why is a personal brand so important to someone just starting out in their career? A personal brand is inescapable and inevitable, whether you're a high school student, CEO or consultant. We've already been branded by many people without even realizing it. The three reasons why every has a brand are that we are constantly being judged based on first impressions, we have to sell ourselves in order to accomplish anything and because we can adopt the same branding strategies that companies or products use. When you're just starting out in your career, you have the opportunity to define your brand before others do it for you. In Me 2.0, the first step in the personal branding process is called "discover your brand." Without investing time in figuring out who you are, what you're capable of, what you're passionate about and establishing goals, you're truly lost. The sooner you can get a grip on what your brand is, and how you want to position yourself in the marketplace, the more time you'll have to prepare for the real world if you're a college student and the less time you'll waste jumping from one career path to the next aimlessly. 2. Do you always need to know what you want to do in life in order to have a strong personal brand? Rohit, understanding your brand is mandatory for your business success and overall happiness. Being able to align your passion with expertise in a specific area is the key to living a great life. Passion is the fuel that will push you through adversity and expertise allows you to fulfill customer needs (clients, teachers, etc). The value you provide is a reflect of your brand and the reputation you build up by providing that value over the course of time, is what will allow you to become more successful. Without cementing your brand in the first place, you'll waste your time on social networks, a blog, on a resume, etc. Everyone needs to be able to write their own personal brand statement, which consists of "what you do" and "who you serve," and it better be a niche if you want to stand out among everyone else. 3. How do you effectively balance your work in building your own brand with your day job at EMC? EMC has supported me from day one actually. They've give me some additional flexibility to speak to organizations, colleges and to appear in the media on various occassions. I'm in a very interesting situation because I was recruited by EMC, after being a product markter for a little over a year, for a brand new position that I got to co-create with the PR organization, called "social media specialist." I've become the go-to-person for social media at EMC, so I get to work on some amazing projects, such as blogs, social media press releases and our various social accounts. There is a mutual agreement and kinship between EMC and I, where EMC's brand helps build my credibility and in return, I help advance the brand with new social technologies. I don't believe in work/life balance at all. I think our professional and personal lives are converging as such a fast pace, that it's gauranteed that there will be no separation in the future. I was telling a bunch of college seniors today at Boston University that when they enter the workforce, their co-workers and management will be friending them on Facebook. Everyone just has to be wiser on how they support and project a positive personal brand. Being associated with other brands means you have to think twice before you update Twitter or your Facebook status. I put in over 100 hours of work a week. I would say at least 50 hrs for EMC and at least 50 hrs for my other projects, such as my blog, magazine, and book. 4. Before getting the book deal, you launched your own blog and magazine. What did you learn from those experiences that helped you when it came to writing a book? Rohit, this is a great question. The second I launched my Personal Branding Blog back in March of 2007, was when I started marketing Me 2.0, without even knowing I was goin to write it. The blog has build a solid reputation over time, being the #1 job blog by Careerbuilder last year and an AdAge top blog, like you have. Both the blog and magazine are assets that have thousands of subscribers each. When the book came out, I notified subscribers of both, in addition to the rest of my marketing plan, that the book was available. The blog and the magazine qualified the buyers of the book because they were interested in personal branding. Each asset that I own helps promote another asset that I own. It's one big happy family! 5. What is the biggest lesson college students usually take away from your presentations? The main theme of my presentation and Me 2.0 is "command your career." It's the idea that college students need to take ownership of their career and stop relying on everyone else to drive it. Instead of being in the passenger seat, it's time to take the wheel and press on the gas. At the end of the day, career success or failure lies in their hands. They shouldn't be what their parents or teachers want them to be. Brand YOU is independent. "Command your career" was my books original title because it was the feeling I had after I was recruited based on my passion. Instead of being asked to do things, people were coming to me for expertise in social media. 6. Now that you have a book out and are doing all this speaking, what's next for you? I need to unwind a little because I'm very stretched right now and it's probably not healthy. I have to take a hard look at everything I'm doing and focus on the areas that will help me the most. I'm also thinking of writing another book for a different age group on the topic of personal branding. I'll continue speaking to gain more experience and I'll continue to think of new theories and applications, while keeping up-to-date with technology. I have a plan, sure, but things are so unpredictable that it's hard to be specific. My end goal with the book (and in life) is to get every college onboard to have a personal branding course.